Some time ago an old cassette tape was unearthed in the National office archives. 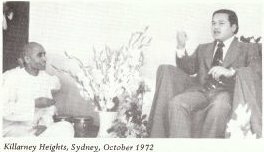 It turned out to be a recording of question and answer session with Guru Maharaj Ji held at Killarney Heights, Sydney in October 1972. 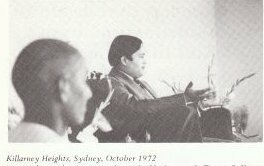 The satsang is not audible in places owing to the primitive equipment used, and the humble placement of the microphone at the back of the hall. Nevertheless, Maharaj Ji's love comes through so beautifully, demonstrating the patience and compassion of the 13 year old Perfect Master, that we felt it must be shared. In the transcript which follows, the irrecoverable passages are indicated by "… ". Well, are there any questions? Can you please stay with us a little bit longer? So if you have some questions, ask. Guru Maharaj Ji, does posture have any importance at all to meditation? Can you lie down to meditate? Well, you see, there are two ways. You can supply water from one tank to another tank by a motor, right? And then there is a syphon process. If there is a lower tank and the water has to be supplied from the lower tank to the higher tank, it takes more power for the motor to drive the water up than to simply drive it downwards into the earth, right? Though still the water is being sent, no doubt. If you want to actually understand something out of this meditation, there's a way to sit. Driving a car can be done any way, as long as you control the steering and control the brakes, but you cannot sit in the next seat or the back seat and then be driving the car. If I lie down and start doing meditation, what will happen? I will go to sleep and not do meditation. When someone is supposed to do meditation in the morning he is still sleepy, until he goes and washes his face. And at night time he just wants to go to sleep, so that's why we like to recommend you to do this meditation sitting up, it's much better. Do you know Lord Krishna and Lord Buddha and Lord Jesus? How do you want me to say I know? I know their names, but I have not met them. Because they didn't exist in 1957 and I was born in 1957. (Laughter) I do not know the people who were born before 1957. Where is the internal struggle? Must we go through internal struggle to come out, or is it a blissful journey, or is it one of many problems? Here is a commonsense thing. This is like room, okay, and it s been lying here, let's say, a hundred years, and you come into this room to dust this room. And when you start dusting what will happen? More dust will rise. Same thing in man; there are piles and piles of ego in man and when this meditation comes, he gets more confused because it raises the confusion to get it out. People don't have all this confusion in the first place when they listen to satsang and then receive Knowledge - then it is a blissful journey all the way. Those people who take Knowledge very quickly and then start to meditate, they have this problem. But that's no problem because after some time things get thrown out and as that happens it gets more smooth. Why do we have such a thing as ego? Ego is nothing. What is darkness? A place where there is no light. So the main thing is to understand that when we do not know this Knowledge, not only the symptom is darkness, but ego is created by that darkness. Ego is nothing, we cannot catch it, but we can finish it of course. Can you see a purpose for man as a whole? Yeah. (Laughter) I can see why man came to this earth and what man is doing and what man should do and I am trying to guide man on this path back. Do you think it is the function of man to live as a whole? Yeah, that's right. That's why God has sent him. But you see if you have a firm with thousands of computers, that firm has not got use for thousands and thousands of computers. And man has got his beautiful body, just beautiful body and man thinks, "I have created the computer," and he becomes very proud of it. But God created this computer before anything was created. This computer can even design computer - a computer cannot design this computer. Understand. And here we are and we do not know our purpose and then always the Perfect Master comes and shows us our purpose. Your followers make certain claims and you don't make those claims yourself, why? Right now I cannot see my face, but they can see my face. So, if I have a black mark they can see the black mark, not me. If I do something - I do something. You see it another way round and I see it the other way around. Okay. You wait for the result at the start and I wait for the result after everything has been done. So (they see something in me that I cannot. If your profession is to drive a car you do not see yourself as a driver - other people do. But you are a driver. Supposedly if a prime minister comes into this room and I am sitting here, I can see what? A prime minister is sitting in this room. But if a prime minister is sitting in this room, he is not going to think, "A prime minister is sitting in this room." He's prime minister and he comes into this room, he is not going to think, "I'm a prime minister: I think a prime minister is sitting in the room." This question was asked on television too. And I told them I do not see myself. I see myself as doing an action; the symptoms to the action - other people see that, not me. When I give them this Knowledge - they have peace because I already have peace. I do not know how much illusion they have in their heads, how much this Knowledge has helped them. I can finally see one conclusion - that it helps them. And they can see for themselves how it is helping them. That's a difficult question. People have been reading scriptures and have not been able to solve it. Primarily we will have to start from all the scriptures. Because all the scriptures want to describe what is God. But I think we can come to the conclusion that God is "G" for Generator, "O" for Operator, and "D" for Destroyer. He generates, operates and destroys. That's one answer. You cannot describe to me theoretically the experience of a pinch, can you? Theoretically I can pinch you and show you. No, that's practically. Go on start describing and I will see if I understand or not. Pinch yourself and start describing to me the pain you felt. A sort of tingling type of sensation. I don't get it. (Laughter) But then I show you the sun. I see it and you see it. God is something that is within ourself, this energy. Scientists have come to this conclusion, energy has never been created and is never destroyed. Only one thing in this world cannot be created and cannot be destroyed, and that is God. That is God, energy, light. An atom is the smallest particle and if you divide the atom, energy breaks out … God is this energy and we have to realise it. "Form" means that energy takes a form which is like Guru. Okay? Formless energy is energy. Formless form of God is energy, and does that energy have any form? No. Guru has form, right? And Guru is a form; energy is formless. But you have to see to consider something formless and with form. God is not visible by these eyes. So He is formless, He has a form yet He is beyond all that. Because you cannot see Him with these eyes. This is a common thing, but commonsense is uncommon. Why did God ever take form? There is no question we can ask "Why?" to God, of course. God is ten times, a thousand times, a million times more clever than us. And any step He takes we do not know why He took that step. If you are the boss of the world and God works under you then you can ask Him, "Why did you take a form?" He takes a form of a Guru to come into this world to enlighten people, to show them a way, to show them a path. That's what we can see, that's what we can realise why He takes a form. If something formless comes into this room and starts talking you, you would freak out. You cannot see anything and suddenly this voice appears before you and you freak out. It is not even these speakers that are speaking! When we realise, we do realise who God is, don't we? We are God. No, because when we use "We", we cut out the God connection. You cannot use "We". Is it safe for me to say that I'm God? materialistic things to go through. Understand. First of all you start with a tiny little thing like a pen, and then there are so many pens, ball point pen, Parker pen, ink pen, other types of pens. And then we start with clothes: a suit and a tie and this thing and that thing. Then you go into houses and you want this house and that house and get into it for years, and finally we have to come to this point where we have to take off and leave everything behind. This is our pace. Man wants to go quickly, he wants to do everything quickly. He wants to realise God quickly. And that means flying this aeroplane. But at a very low altitude - twenty feet only - what's going to happen? He's going to hit something, reach nowhere, just go down and then go up. Die. But if he flies at an altitude of say, three thousand feet or two thousand feet he's quite secure, until a mountain or something high comes. And he can go up still higher: he can go five, four thousand feet. There is no danger there, he is getting somewhere. So here we have to rise up, we have to get high so that we are high enough that we don't crash into anything in this world. Okay, the problem is how to get high. You have got a propeller airplane and propeller airplane is not even pressurised. You go to some level and then you start to pull the stick and it just falls, you can't go any higher, you just get stuck there. You reach no point. But Guru has got jet. He can transfer you to this jet and take you much higher, to much securer place at a much faster speed. The place you want to approach, the so-called direct route. This is the problem with a human being, because when he starts to fly he hits things and the things that he hits are his desires. You want something and man is not satisfied with this, he wants a bit more, and a bit more and a bit more and a bit more, until he comes to a conclusion that he needs the whole world. That's his only satisfaction and that is not possible. So to make it possible he fights. For instance, why is America fighting Vietnam? Vietnam does not come at night to eat America up. Why is there fighting? They want it, they just want to kill everyone. One particular reason behind it which you might read in the newspapers is that there are communists in Vietnam and Nixon wants to kill the communists. But still they want to kill them, right? How much killing is going on? We realise that those people in America are Christians, they believe in one Jesus, no matter whether they are Protestant or they are Catholic or anything else they believe in Jesus. Imagine maybe there are Hindus in America, there are Moslems in America, there are Christians in America - so many Christians in America. Religions all believe in God. In Vietnam there are so many types of religions which believe in God - and in God being their father. And God being their father - America's and Vietnam's father - if there are two people with one father they are both brothers, they are brothers and brothers are fighting. In spite of realising. If we have an ordinary father and we fight - it's no great problem but we have such a high father, the greatest father that one can ever have - God - and still we are fighting, serious clashing and the whole world is going through this serious clash, collision of hitting things. And this world is building up like New York City - so many high buildings, so many high buildings, so many high buildings. 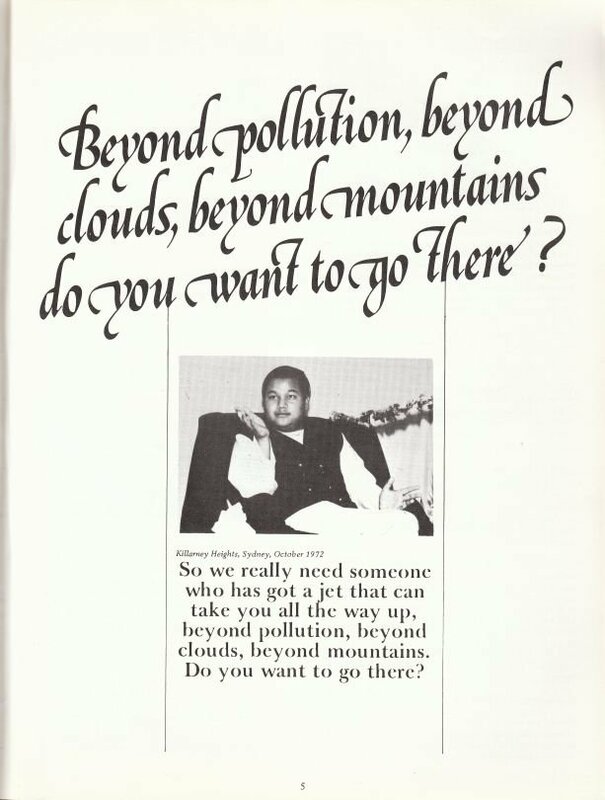 So we really need someone who has got a jet that can take you all the way up, beyond pollution, beyond mountains. Do you want to go there? Will there be a third world war, can you see one? Why do you ask that question? What to you have to do to prepare? Maybe to accept this third world war. What's going to happen if you don't accept? You're not a president, you're not a prime minister. It's not that if you don't accept the world war the war is not going to take place. Why do you want to know? I'm trying to. I'm trying my best. When a soul reincarnates as a baby does it choose its parents? How does it work then, Maharaj Ji? It's God's plan, it's God's idea how He works this out. It looks like those people. See there are two things in the world: fate, or luck so-called, and then work, practically, hard work. Those who simply believe in fate become rich and important. Okay? They have got a very high type of up and down. People who trust fate, do not have high ups and downs. For instance, a baby comes here, God has sent it. Whoever that might be and for what purpose, you do not know. There is one basic purpose - that he is God, his mother is God, his father is God, his brothers are God and his sisters are God - one basic purpose. But then the next purpose is that he is come. And how God has figured that out is quite impossible for us to really understand like that, we must follow the basic thing we have come to know. The Knowledge you revealed to us, did you realise that by meditation, or were you initiated by your father beforehand? My father gave it to me, then I meditated then I realised it. When you are practising your techniques, do you reach a point in which you know for absolutely certain that if you pass over worldly form at you will merge? It is not a beacon that goes on your head that says, "Yes, there it is and if you die you are going to pass over the world." But if you are getting peace understand then certainly we are indicating one thing to ourselves, that our soul is having real communication with God. That is what peace indicates … If we are getting peace it means our soul is being allowed to be one with God, understand. And if that is happening, it is sure that when we have finished this fight we will be one with Him. Why is it that some people have this desire to realise God and other people don't? They have a desire to realise God but maybe not in terms of God. Maybe they don't realise in terms of God. Maybe they don't realise in terms of God. We are all looking for something. Not God, maybe peace. Maybe not peace, maybe Knowledge. Why are there people who go and study philosophy? So they can get glimpse from somewhere, so they can realise something. Everyone has that desire to reach satisfaction, hasn't he? 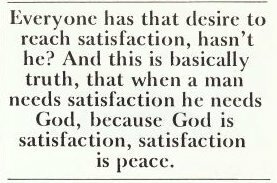 And this is basically truth that when a man needs satisfaction he needs God, because God is satisfaction, satisfaction is peace. What if somebody gets satisfaction out of something that's not a permanent thing? We are looking for permanent satisfaction. Understand that. I've seen people and they buy a house, a small house, and then they move into a bigger house, and then finally they build a house for themselves, a big house. They need a big satisfaction. The same way it goes on, it goes on, looking for satisfaction, satisfaction, satisfaction. Finally we have to get satisfaction, and we get it if we approach the appropriate channels. Everybody is looking for satisfaction, peace and happiness. Some people have to drink liquors, because they need satisfaction and in the morning they get up and they are just off their heads. Some people think they can get this satisfaction and not even know what is happening to them. Some people think it's earning money. That reminds me of Hollywood. Still it is not satisfaction, it is not the thing we require, we are needing, we are looking for. Religion is supposed to re-unite man and bring everyone together in peace. Why is it that religions are fighting against one another? That's the example I give to people! The reason is, the word "religion" started from the word "realisation". If you supposedly bought a limousine and you start using it like a truck - what will happen? Take a cadillac limousine and fill it with sacks of grain, of rice, and so on. It will start leaking inside on the seats and so on. So it's the same with realisation. Actually we only just want to realise God. No master, no saint teaches religion. Jesus did not preach Christianity - we do it after him. Buddha did not preach Buddhism - after Buddha we created Buddhism. Mohammad did not preach Mohammadism. No master preached like that because they gave instant realisation. We miss the realisation, that's far away and then we get into these things and then we make a mess of ourselves and that's what's happening. Instead of having realisation of God we are having realisation of wars. Guru Maharaj Ji, how can we stop turning the Knowledge you've taught us into a religion the way all the other followers of the masters did? I don't think I would like you to do that. I don't think I would like you to make a religion after me. Then how can we prevent that from happening? I think the easier way - we can find out. We can surrender and that's that. But there's already so much, if you'll forgive the word, superstitious nonsense that has grown up around you. You speak and you claim not to be what some of your followers claim you to be. The problem is claiming is a claiming thing, and so if someone claims something maybe he can prove it. When you claim something in court that means that you have to prove it. The lawyer who did not commit a murder has to have more proof and better proof than the man who himself has just committed murder. Don't you think songs like "We Love You Guru Maharaj Ji" are making it into a religion? If people are saying we love you, you as person, isn't it to indicate that after you, they will make it into a religion? No, they only mean we love you Guru Maharaj Ji. They do not love Prempal Singh Rawat, they love Guru Maharaj Ji. What is Guru Maharaj Ji? Guru is someone who has taken us away from illusion and put us into light. Someone salutes a prime minister and someone says, "God, he is saluting her, why don't they salute the lady who is walking down the street much more well dressed up than here?" Because we do not salute her suit, we salute her personality. We have a lady prime minister in term of India. If you are really saying Knowledge is Christ, would it be easier for you to spread the word by just doing a few miracles here and there? One point we can understand, that Jesus went to this well where people were drinking water, and where he says, "I can give you that water which is within inside of you,"
and he gave that water to someone. We take that as miracle, and that's what people were saying because he showed this light to a blind man. Wasn't he actually curing flesh and breaking loaves and feeding thousands of people? There is no need for me to do that, as he has already taken care of that. If that means that you want me to go without food - (Laughter). Not every prophet has created miracles. Jesus was not always day and night performing miracles. At that time it was pretty hard for people to believe that God existed. Why? Because the Ruler, the King of that time, was supposed to be God. They had power, that's why they were supposed to be God. Jesus had to show his power to make people believe he could give them the Light, and they could therefore believe in this thing he said, that "I am the son of God." But here, people are able to understand. I hope so. Is God playing hide-and-seek within us all? We are playing hide-and-seek from God. How can God play hide-and-seek? God is omnipresent. We play hide-and-seek from Him. He is our egos too, He is everything. No, because ego is nothing. If everything is God, how are we? What is house, can you show me what is "House" in this house? I'll take you outside and show you. No, no, you will show me a wall, a colour, structure. I asked you what is a house? What do you call a house? A house is a combination of so many things. We cannot take a particular thing and say this is God, this is a house. This was a joke our science teacher did. He asked, "Where is the school building? This is not a building, this is a wall. This is the back wall, the front wall, the windows, the doors, but where is the school building?" You understand? Because God is energy inside us, this body is made up of energy. Two plus two make four, but two is not equal to four. Energy combines and makes body. Energy is God. But energy is not equal to this body. Energy of God is whole, we are part. You can relate to it. You can relate to a dog, and give him satsang. That's a good question! If there is a car going on a track, and it falls off, who's going to put it back? Shouldn't you be here all the time to keep us on the track? That's right … Knowledge is reacting, energy is reacting all the time, 2 hours, whether you are in your house or anywhere else, okay There is this energy that has been revealed to you that is always acting, it's not just my physical presence … This is what is important to me because one energy is always acting, working 24 hours a day. Truth is important to me but it appears that you play games, little tests. I play little games? It's pretty good you know, if you start a car and you want to do a long journey in it, it's pretty good to do some testing. It's not bad. If you want to give someone Knowledge you do some playing around to make them understand. There are little tests. What about the premies who are in Melbourne who need to see your physical body? There are premies in Africa, South America, people in California, and there are people in India and there are people around the world many, many thousands who have a need to see me. It's only an hour and a half to Melbourne though. A lot of people in Melbourne were not able to come because they had responsibilities to their work. I understand. I have responsibilities to my work too. There are four jumbos leaving for India from America. We are organising our international headquarters. Then we are going to publish this magazine which is right now in its final stages. Then we are going to make this L.P. and publish it separately. So many things have to be done. In Melbourne many premies down there have been working all the time They are waiting for you now. Just for one hour. That's great. 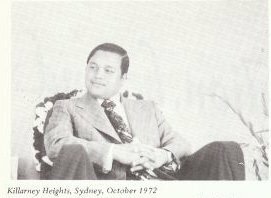 You have to understand, you see me at one point sitting in Australia and think I can go to Melbourne. In theory the Mission is just started, not even primarily started. In America it s just incredible - it's too much. It's too much in Melbourne really. We need you more just to keep it going. To get it on its feet. Give us extra strength. How does a humble devotee become a Mahatma? Well, I think you should come and listen to satsang.